The Geriatric Medicine Fellowship at the UCI School of Medicine is a comprehensive and challenging one-year advanced training program that prepares physicians to deliver compassionate, informed care to a diverse aging population. Fellows learn to manage patients with complicated co-morbidities as well as to offer suggestions on healthy aging, using not only their medical knowledge but also drawing from their natural compassion for others. Two fellows are accepted annually to the program, which provides flexibility for the unique learning needs of each physician. Fellows work with experienced geriatricians and other skilled specialists, who model the delivery of sensitive patient care and support. Fellows receive training in the diverse range of career options open to geriatricians. Longitudinal rotations include ambulatory care, interdisciplinary patient assessment through our Health Assessment Program for Seniors(HAPS) and long-term care. Past fellows have graduated and taken positions in academic medicine, the Veterans Administration, group practice, Kaiser Permanente, and other settings. Fellows who complete the program are eligible for a Certificate of Added Qualifications (CAQ) in Geriatrics. The program has been accredited since 1991. The geriatric medicine fellows are trained for the diverse range of career options open to geriatricians. Longitudinal rotations include ambulatory care, interdisciplinary assessment (through the Health Assessment Program for Seniors, or HAPS) and long-term care. Each fellow is assigned to a panel of ambulatory patients for a half day each week in the SeniorHealth Center at UC Irvine Medical Center in Orange. Supervising geriatricians on site select patients with the aim of providing the broadest range of medical experiences to enhance learning. Fellows begin by observing and assisting in HAPS until they feel comfortable assuming care for these complicated patients, then progressing to team leader, facilitating the interdisciplinary determination of a diagnosis and treatment plan. Next they meet with patients and their families to present the team's conclusions and collaborate with the patient and family to implement a treatment plan. Each fellow is assigned patients to follow in long-term care. Again, the supervising geriatrician is on site to provide consultation. This allows fellows to work with the frailest of older patients and their families in a setting where there are fewer technological supports than at a hospital. They also gain experience working with a team. The two main teaching sites for the Geriatric fellowship include UC Irvine Medical Center and the Veterans Administration Center in Long Beach. Aside from this, fellows have longitudinal rotations in nursing facilities as well as home visits. The heart of the fellowship is in the SeniorHealth Center, where fellows have their continuity and consultation clinics (HAPS). Here fellows work with continuity attending on a weekly basis, learning the art and medicine of geriatric ambulatory care. 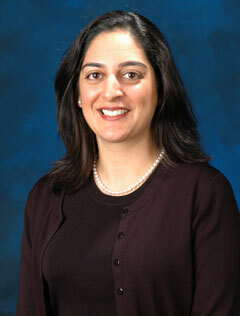 Many of the subspecialty rotations are located at UC Irvine and well as the inpatient consultation service. At the VA Long Beach Healthcare System, fellows participate in the Geriatric Evaluation Management (GEM) Clinic, an interdisciplinary program which assesses and addresses the medical and psychosocial status of frail older patients. The goal is to optimize each military veteran's health, function and ability to live with the greatest degree of independence possible. In addition, the VA is a site for inpatient geropsychiatry as well as outpatient rotations in Parkinson's disease, memory and movement disorders, epilepsy, and physical medicine and rehabilitation. Our Division of Geriatric Medicine & Gerontology teaching program is also affiliated with five skilled nursing facilities and the country’s first Elder Abuse Forensic Center. 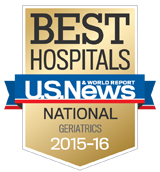 As is typical of many one-year geriatric fellowships, we do not require original research. However, fellows are encouraged and supported with research interests they may want to pursue. At the Division of Geriatric Medicine & Gerontology, we use the Electronic Residency Application Service (ERAS), sponsored by the Association of American Medical Colleges. We no longer accept paper applications. For questions about the application process, go to ERAS or call 215.966.3940. Interviews are arranged by invitation after a review of the completed applications. Please refer to the ERAS for the application process. 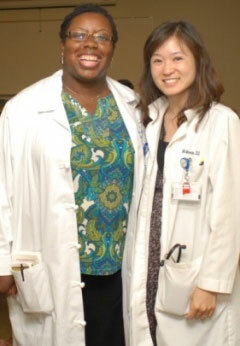 Michelle Lewis (left) and Dr. Michelle Fujimoto (right), Geriatric fellowship program graduates.